Guest post by Michael J. Martinez. Writing about racism and sexism is daunting no matter the medium, whether it’s a novel or, indeed, even this guest post. 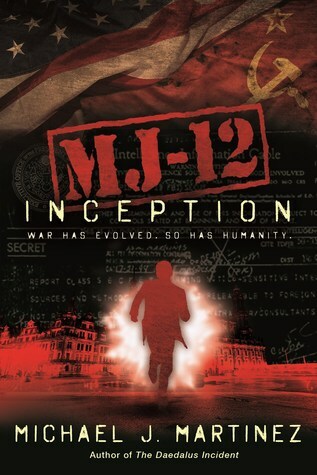 And when I wrote MJ-12: Inception, set during the Cold War in the late 1940s, I really wrestled with how to approach it. But here’s the thing. I wanted to write diverse characters in MJ-12. The protagonists of this book, called Variants, have been mysteriously imbued with paranormal abilities – superpowers, in essence – and it’s a rather random thing. So imbuing a bunch of white guys seemed plain old dumb. So of the five main protagonists, one is a woman and another is an African-American man. (There are other women and people of color mentioned, and more coming in the next MAJESTIC-12 book in 2017.) And if you’re going to set a book in 1948, you’re going to have to deal with that systemic racism and sexism. It was pretty bad back then. The armed forces were still segregated, and African-American soldiers were treated poorly. Back home, women were pressed into the workforce and were empowered in so many ways – only to be sent home after the war to make room for the men returning from overseas. The end of the war actually made things worse for women and people of color, even as their treatment sowed the seeds of the civil rights and women’s rights movements. Yes, MJ-12: Inception is historical fantasy, but the fantasy part – at least in my worldbuilding – wouldn’t magically erase those issues. And frankly, I didn’t want to whitewash things either. Ignoring sexism and racism in the time period seemed disingenuous, and I felt would really disrespect what women and people of color went through during this period. Thus, there’s racism and sexism among the characters in MJ-12: Inception. It was amongst the most painful stuff I’ve had to write as an author, and I made damn sure to research things carefully, to understand the points of view of all involved, to talk with women and people of color about it to bring as much care and diligence to it as possible. And yet at the same time, there was a story that had to be told – a paranoid spy thriller with superpowers and exotic locales and, yes, even some nifty gadgets. The whole thing was a balancing act that left me uncomfortable at times. But then, I suppose that’s a good thing for a writer to experience. In some ways, the MAJESTIC-12 series is an exploration of being different, being feared for being different, and what all that can do to people. I’m particularly interested in what it will do to Maggie, a woman who can manipulate emotion with a thought, and Cal, an African-American man who can heal – or harm – with a touch. Prior to gaining these abilities, Maggie and Cal were still treated differently and unfairly by society at large. Now, they’re very different, and while that gains them a bit of acceptance among some of their fellow Variants, it scares a lot of other people even more. And what happens when Maggie and Cal face these biases again and again, knowing that they’re actually more powerful than the average person? To me, those are fascinating questions, and as I write more in this series, I’m looking forward to uncovering the answers. Michael J. Martinez is the author of MJ-12: Inception, newly released in hardcover from Night Shade Books, as well as the Daedalus trilogy of Napoleonic era space opera novels, now out in mass-market paperback.